I found myself feeling drawn to this hanging purple wisteria the other day while I was on a photo shoot. And then I found this quote by Willa Cather, and knew it was what I needed to see and hear this week. Please do not copy the photo without permission and attribution. Thanks! © 2012 – 2014, Food Fun Family. All rights reserved. I didn’t know this quote was from Willa Carter. It’s one of my favorite quotes. The photo fits it well. 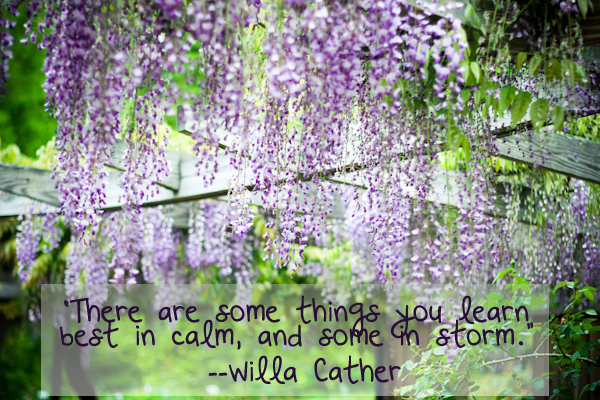 I do so love wisteria, gorgeous photo and I love the quote, thanks for sharing! Gorgeous picture! and I love the quote.